First up, Jeanswest have a 30% off sale online right now. It includes everything, even all their new spring stock, which I love as it features blue pretty heavily! If you're looking for a pretty update to your wardrobe, check out the sale. It's only for a limited time, so if you've got your eye on anything I suggest snapping it up quickly! The sale includes menswear too if you're looking for a little last minute something for Father's Day this weekend. As for what I've been wearing, more maxi skirt outfits! They really are the best option for keeping me warm and still allowing me to wear my knee brace. Which I'm hopeful I'll be able to go without soon. I'm making great progress with the physio working up to getting the full range of movement in my knee again. No jacket! It's officially spring, and this was taken in the last weeks of winter. I'm trying to make an effort to get a last wear out of some of my winter pieces before they are packed away. I did think about wearing a scarf with this also, and in the early morning it would have come in useful, but defintely wasn't needed in the heat of the day - I ended up rolling up the sleeves from the jumper as it heated up. I was just working from home with a short break in the afternoon to go get a scan and find out how much damaged I'd done to my knee. I'd thought of wearing this skirt as it as the slit up the side, for easy knee access, but the slit is on the other side! I ended up wearing it anyway. It was easy enough to roll up to let the lady look at my knee. 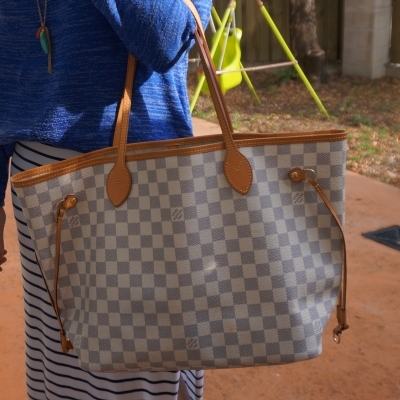 Last worn: blue jumper, striped maxi skirt, studded mouse flats, Louis Vuitton neverfull. Other ways to wear: blue jumper in the office, striped maxi skirt in summer, mouse flats and print mixing, Louis Vuitton neverfull with shorts. I felt amazing in this outfit, even if it does look a little odd in the photo. Should have tucked the tee in, so it didn't overwhelm my frame and make my already short legs look really stumpy! I had looked in the mirror that morning and decided it looked okay to leave it loose, a nice relaxed outfit for playgroup with the toddler. I got this tee and skirt around the same time, so I'd been wanting to wear them together for a while. While it's not the best photo, and seeing it made me wish I'd tucked the top in, I enjoyed wearing it. Last worn: Ray-Ban Wayfarers, black cardi, red tee, printed maxi skirt, black ballet flats, Rebecca Minkoff canvas stripe mini MAC. Other ways to wear: black cardi and skinny jeans, red tee and skinny jeans, neutral outfit and bright bag with a printed maxi skirt, ballet flats in the office, Rebecca Minkoff mini MAC with jeans. Linking up with Pleated Poppy, Style Me Weekly, Oh Hey Girl, Trendy Wednesday, Thursday Fashion Files, Throwback Thursday, Fun Fashion Friday, Weekend Link Up, Casual Friday. Love both of theses maxi skirt & cardi outfit combo's! They look cute and put together plus very comfy which is always a bonus! How funny that it is officially spring where you live! We just started our transition into fall, but this maxi skirt would still work perfectly. I love how you styled both of these skirts.. You look gorgeous! Yay Spring for you, and Fall for me. (; It's funny because at some point we will literally be in the same temperatures, wearing similar outfits. You know, the cool Spring and early Fall. 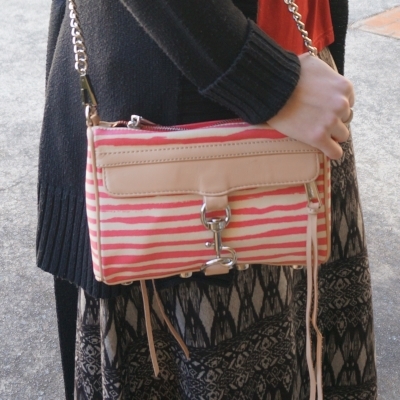 I love that striped maxi and how fun is that Rebecca Minkoff bag?? Great looks! That second outfit is so beautiful! I often don't realize that I should have tucked in my shirts, too, in certain outfits until I see photographs of myself. LOL! haha yes the mirror can be deceiving sometimes! And thanks for bringing the news about the amazing sale, hun! I can't wait to relegate the jacket . . . still very wintery down here! The first blue outfit is amazing.. and I like bag in second outfit.. Both of these outfits are beautiful! I really love the cobalt blue and stripes! Hope your knee is on the mend! Glad you're making great progress, Mica! Your first outfit looks fresh and maritime, love the sweater! The second one turns harmonic - the red striped black is eye catching for sure! haha yes I'm lucky to be well practised in wearing maxi skirts now! Love that striped maxi skirt outfit! The sweater looks really good paired with it. And the colors are spot on together in the second outfit! I love all of the maxi skirts you're wearing! Beautiful prints. Seriously cute outfits. I've not heard of this website before - I must give it a whirl! Also leg brace? What happened! Are you OK? Thinking good thoughts for you! Loving that cobalt blue, lady! Maxi skirts are turning out to be such wardrobe hero. They look awesome & they work with your brace. Hope you leg gets better soon though! I’m really like blue again of late & i love your first outfit! Yay for spring! Love the printed maxi and how the sunburst necklace picks up on the print. Yay for no jacket! And you have such an impressive collection of maxi skirts, I love both of these! Especially the stripes...I'm a stripe addict! What cute outfits! Sorry to heat about your knee. I would have never know you were wearing a leg brace. Great idea about wearing a maxi skirt! Yep I'm lucky I can hide it under a maxi skirt, no chance of wearing jeans with it, haha! Love that second outfit, the autumnal orange top is lovely with that print skirt! You have a great collection of maxi skirts, I hope your knee is getting better! both maxi skirt are just wow....but the striped one is my fav! 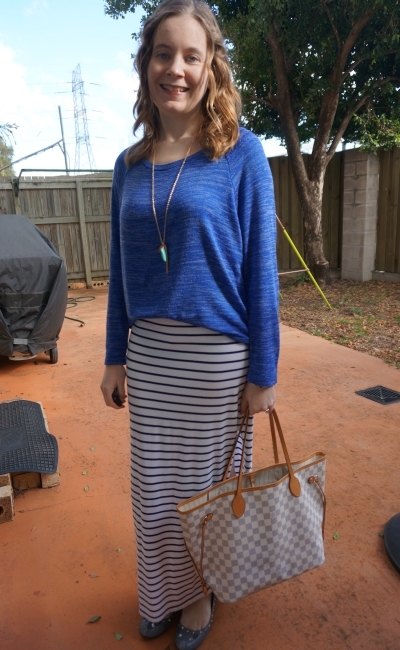 I love that blue top with the striped maxi Mica! They look so good together! Thank you all for your lovely comments and kind get well wishes for my knee, it is slowly improving.